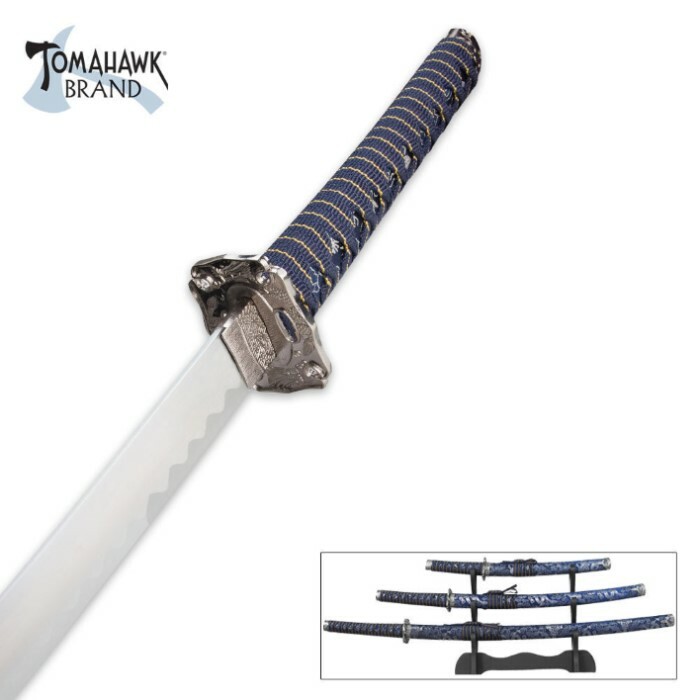 Evening blue and yellow samurai sword set with table top display stand. Each sword is equipped with a stainless steel blade. The nylon cord wrapped handles are accented with metal tsuba (guard) and pommel. The matching scabbards and handles are adorned with blue nylon cord wrapping with yellow trim. Katana: 36 5/8 in. overall, 25 1/2 in. blade. Wakisashi: 28 in. overall, 18 in. blade. Tanto: 18 in. overall, 10 1/2 in. blade. Comes complete with the black display stand shown. This is a nice 3 piece set. Something I have wanted for some time! this is the best set ever .So far it is very durable and it is a great desplay for guest .It has a good price and my guest said they would by t for much more.